Woddity week continues here on Retro Renovation. Lookie this: A Universal Rundle bathroom sink faucet with sort-of lever handles that sit underneath a big clunky… spaceship?… turtle? This is pretty wacky — and wonderful! 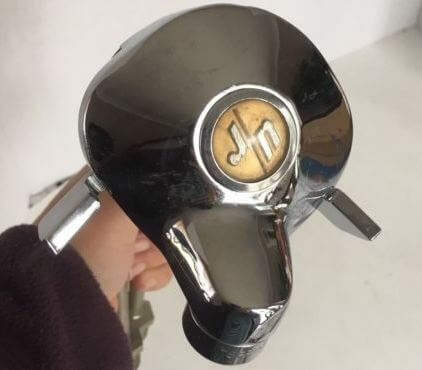 We help Donna identify her mystery faucet! Finally! Five years ago we purchased a small Aladdin kit home from the original owners who built it in 1959. Like many homes of that era, there was just one bathroom. However, the master bedroom had a long vanity with custom built-in drawers and a large oval sink with a wide sloping edge. 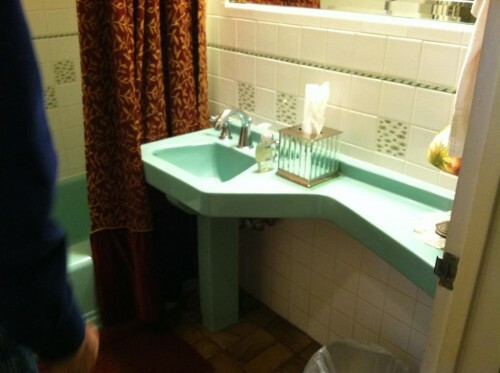 The sink’s faucet was the most unusual and beautiful vintage plumbing fixture I had ever seen. Unfortunately, after a year of our ownership the lever for the cold water broke off. My husband took the faucet to a half dozen plumbing supply stores on the hope we could find a replacement part, but no one had ever seen anything like it! We scoured salvage plumbing parts to no avail. By now, you have probably figured out that our faucet was a Universal Rundle! Our faucet was more rectangular in shape than the one featured in this article, and so unique I have kept it despite being broken. I spent countless hours trying to research it’s maker — but mistakenly thought it was “j/n”, not “u/r”. When we gave up looking for parts, we purchased and installed a new faucet that is complimentary to the vintage design of the sink. That was a real trick though, since the sink had only one large diameter hole designed to fit the Universal Rundle faucet. We had to get real creative with a repurposed escutcheon plate, but eventually we made it work. I must admit that It is nice to have the spout further from the back of the sink — esp. when rinsing toothbrushes! 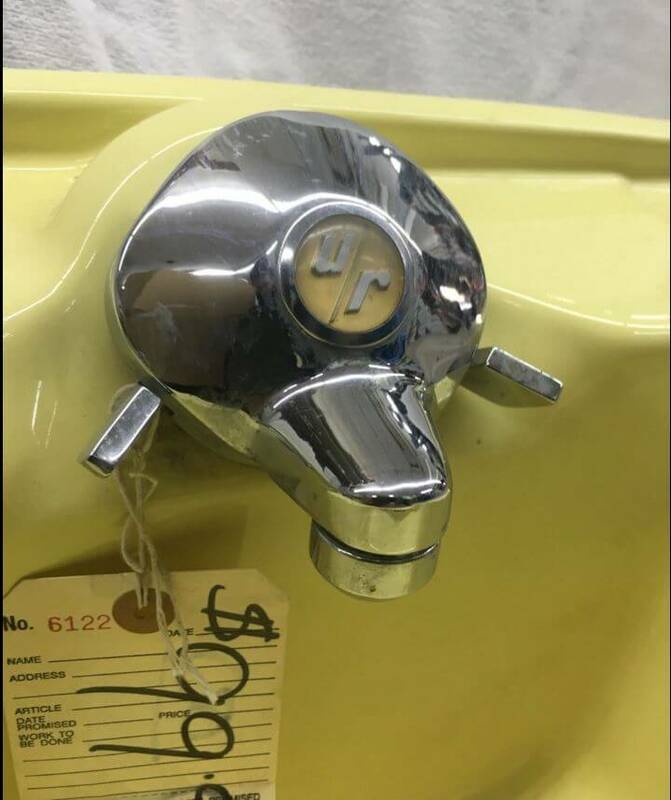 I’d be happy to send you a picture of the Universal Rundle faucet we own if you’d like to add it to your “woddity” file for Universal Rundle faucets. Your site has been a phenomenal resource for me over the past 5 years. THANK YOU! It’s my pleasure to send you the faucet photo. – Enjoy! Universal Rundle Sink — New Old Stock! But wait! The ebay seller also has an entire assembly — a vintage Universal Rundle bathroom sink. Looks like this turtle/spaceship faucet is specifically designed for the sink. The “shelf” is angled. When buying vintage — including New Old Stock — with the intention of installing it, be sure to research whether the item is up to current building code and safety standards. For example: Vintage lighting, even if new old stock, should have its wiring checked — and there may be other issues — get with a pro. Vintage plumbing pipes may not be up to current standards for, for example, lead. Get with your own properly licensed professionals to help you assess what you have so that you can make informed decisions. For more info see my Be Safe/Renovate Safe page. New Old Stock hardware store being unpacked as we speak! Thank you! 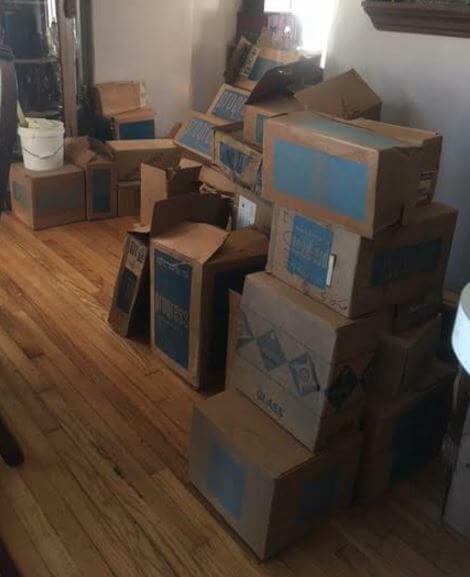 I have literally an entire warehouse of new old stock items. It’s all very fun to look through. 100’s of sinks and 100’s of light fixtures. My father-in-law used to buy out old hardware stores in the 60’s and put everything he bought in a warehouse thinking he would go through it all someday and never did. He has given me free reign in selling it off. If there is anything in particular your followers like let me know and I will get it listed so you can have pics. — when you get there, look for the Search box that says SEARCH WITHIN STORE, then type in New Old Stock to narrow search. Above: Some of stuff being that was being prepped for listing last week. More to come! Oh My. I think another reason for design obsolescence in this case is the single hole for the faucet. 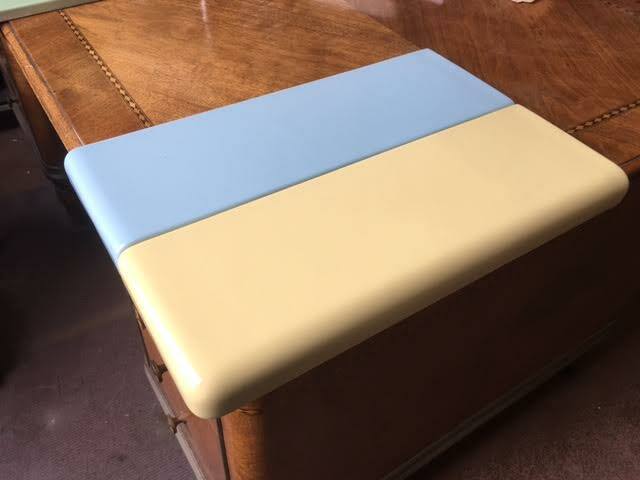 Now there would be a number of options for Donna’s sink because it mounts flat on the deck, but for the yellow sink with the slanted mount, there still isn’t anything new, to my knowledge, that would fit the bill. How many single hole faucets were there between the 1950s and 1960s when these were made (and stopped being made) and the upsurge in the American single holed faucet designs around the turn of the 21st century? I don’t think there were many except lab faucets. Most of the single handled, close coupled designs of the 1960s-1980s were three hole, 4″ center sets underneath. So I think a lot of these sinks disappeared because when the faucet had to be changed, the sink had to be changed because of lack of options. In my experience you can find new replacement parts for old style faucets if you have the right kind of plumbing supply place and they are willing to look for it, but it’s often easier and may cost about the same to pull out the old sink and faucet and install something completely new. 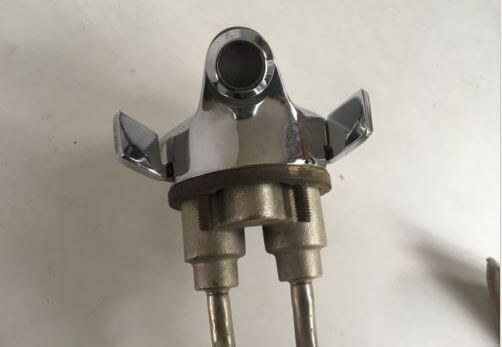 I had a client recently replace a faucet and a shower mixer completely because they were dripping rather than even trying to attempt to replace a part. Many plumbers would rather do this and for a DIYer it’s probably easier than repairing. Yes, looks like it’s a 4″ spread. But I am actually confused looking at the first U/R I spotted. Looks like it’s not single hole. I am not an expert at any of this…. Go-to sources for fixit parts, as I recall: deabath.com and Locke Plumbing. There may be others. You are right, it looks like it would require two or three holes in a spacing proprietary to Universal Rundle plumbing. Although fixed single-, two-, or three- holed sinks and fixtures on standard 4″ or 8″ centers makes for some repetitious design, it’s understandable why some standardization is necessary. I grew up in the house that I now own, and dealt with the cat and mouse chase of finding parts that fit Universal Rundle plumbing fixtures. (I inherited the house after my folks passed away). 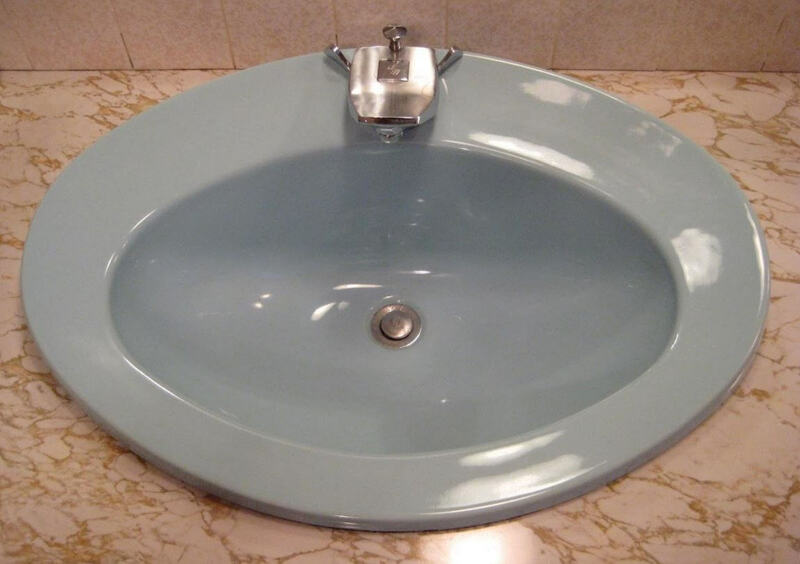 For many years, the bathroom had a peach bisque wall mounted Universal Rundle Sink with a built in 3 piece faucet. 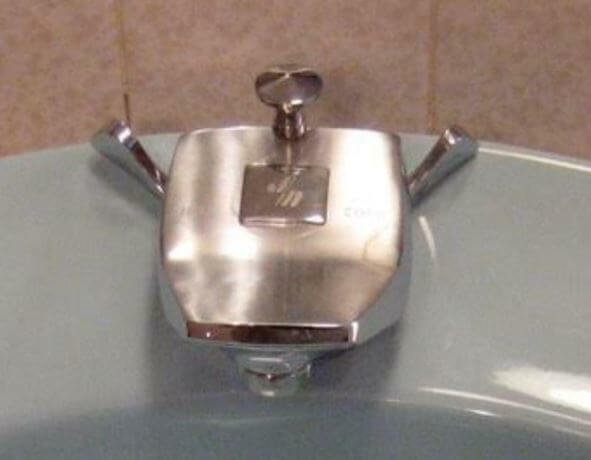 The faucet handles were the first thing to go and were impossible to find at any hardware store and Sears as well. Sears was the biggest distributor of Universal Rundle sinks, tubs and toilets in Southern California back in the 1950s. 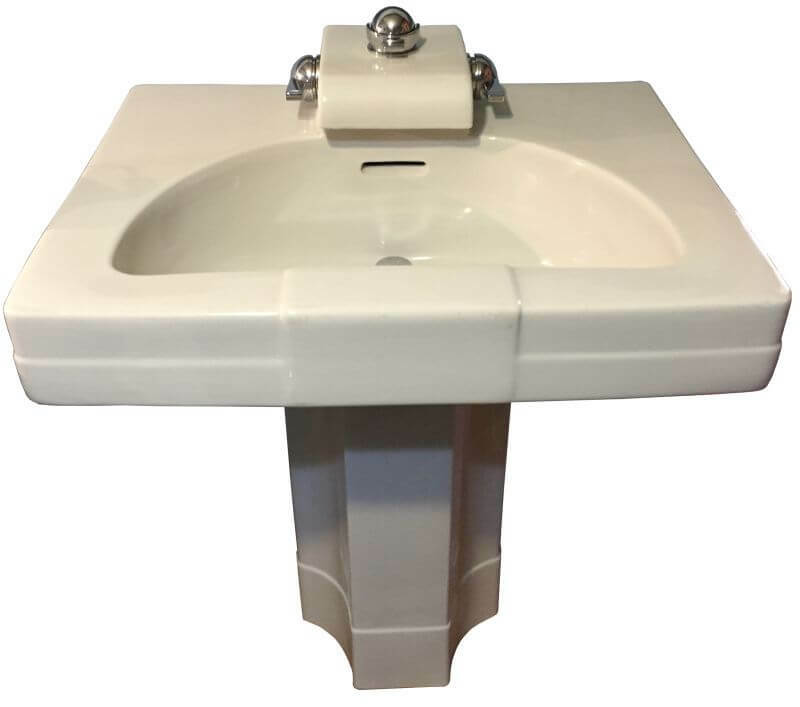 After the sink was on its last legs in the late 1980s to early 90s, we removed the wall mount sink and replaced it with a cabinet and marble colored lavatory from Montgomery Wards. I still have the original peach bisque Universal Rundle Toilet and bathtub in the bathroom. 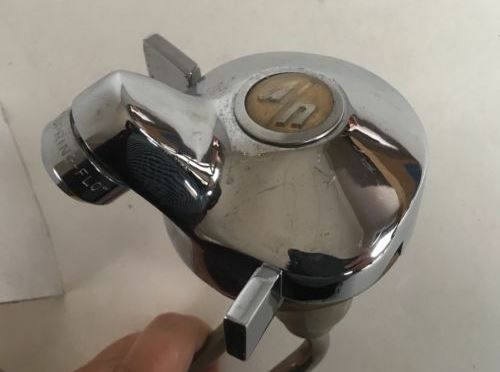 A plumber replaced the Universal Rundle tub and shower faucet assembly with a Price Pfister unit in 1991. 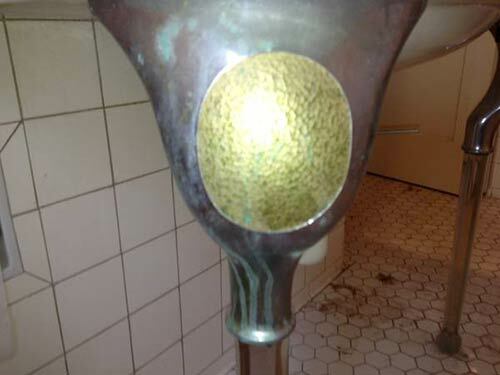 I also refurbished the toilet tank in 1995 by replacing the ballcock and flush valve. It currently has a Fluidmaster unit, which saves water. 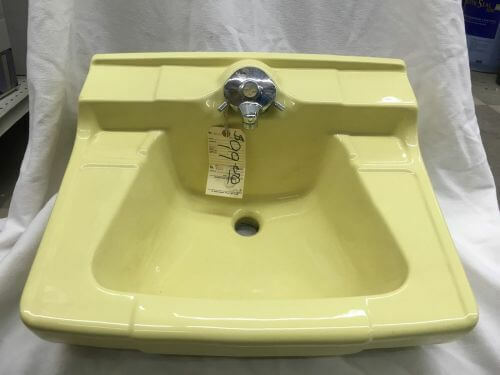 One more thing about the yellow U/R sink: the indentations on the lower left and right sides are built in soap trays, designed to drip into the lavatory. U/R tubs also have that feature in a front corner located next to the wall.